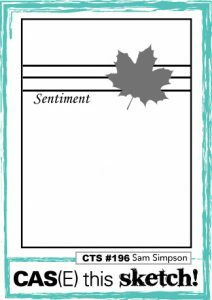 I’m back today with another card sharing some of the new products from the Picket Fence Studios October Release. For today I combined an adorable new image with a sentiment from a not coordinating but oh so perfect set. I love this funny little owl and her quirky look! Those eyebrows make me chuckle! There is another new sentiment that is awesome for her (Throw on a Crown) but I needed one that I could use with a sketch from CAS(E) this Sketch. So I chose My Man, My Friend…some of the sentiments are for the men in your life but others are universal. This one seems like the perfect fit with my Princess Owl! I colored her with Copic Markers and then added a little doily behind her for texture. This sketch was perfect for showing her off! I originally planned on a white base but that was a bit too plain so I chose a base of Lemon Cardstock instead. This is such a pretty yellow! So that is it for today. I am back tomorrow with the latest from Freshly Made Sketches and on Thursday with another of the new sets from the October release. So glad you stopped in today! See you tomorrow! 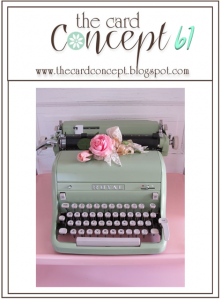 I have a fun card to share with you today over at the Picket Fence Studios blog. Many of you know that I tend to hoard collect sentiments and this sentiment set called Crafty Friends is simply amazing. I though it would be great if I simply focused on it without any images but wanted the card to feel special enough to sent to a crafty friend. 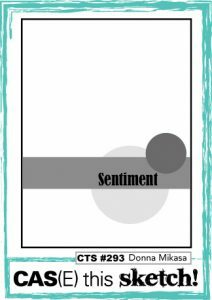 Back in March when I was at Stamping Away, I created this background after I saw some inspiration by the awesome stampers who joined me. 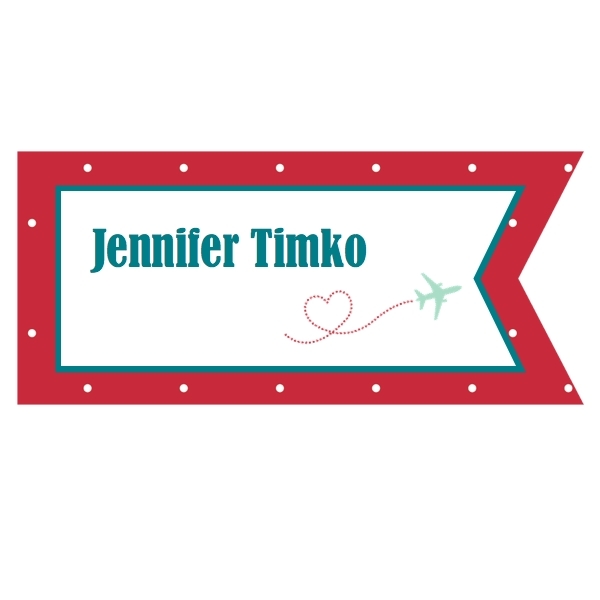 My friend Jill told me about a great way to use the Tonic Nuvo Glimmer Pastes. Using a background cover plate from My Favorite Things, I created a disposable stencil. All you have to do is lay it down on card stock just like any stencil and apply the paste. I got two cards out of it before it was a big mess and then could just toss it. If you do want to use the pastes with your real stencils, take care to wash them off immediately since the paste dries quickly. I used two colors here…so pretty! My sentiment was stamped onto vellum with Versafine Onyx Black Ink and then heat embossed with Wow Black Glint Embossing Glitter. 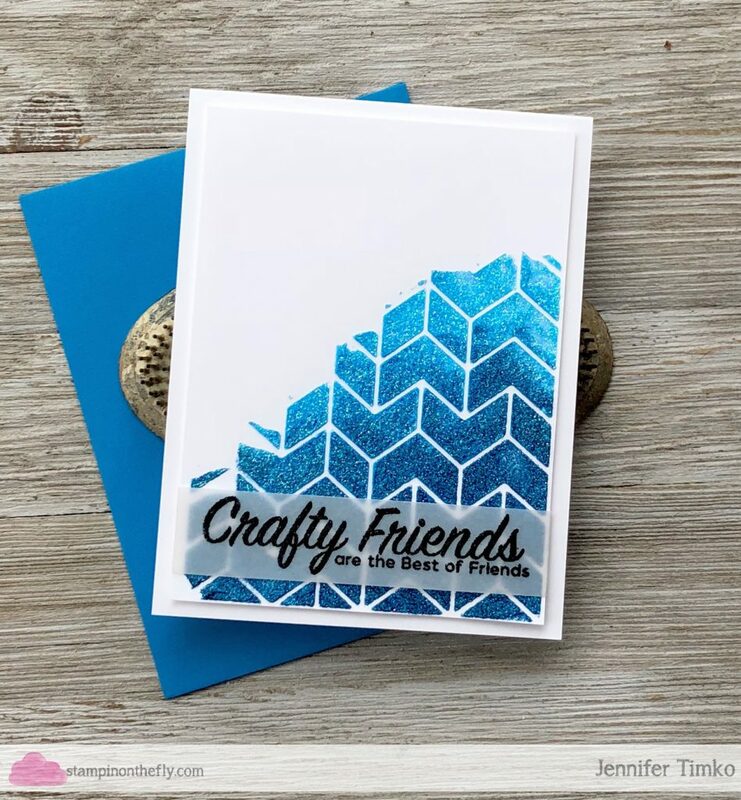 It has a bit of a shimmer and shine that regular embossing powder doesn’t have. Perfect against this background. I created this with this week’s CAS(E) this Sketch challenge as inspiration. Perfect for showing off great sentiments! 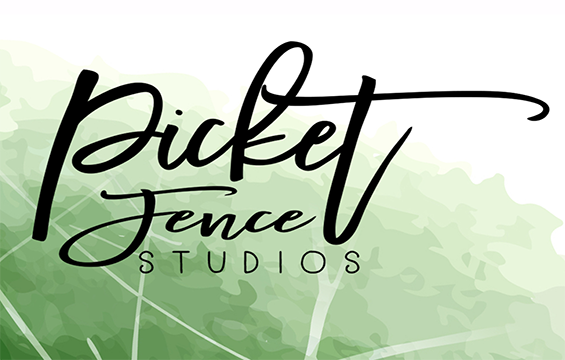 I will be sharing posts about every three weeks over on the Picket Fence Studios blog (as will all my fellow design team members) so we would love to have you visit over there for inspiration. Thanks for stopping in today. See you soon! 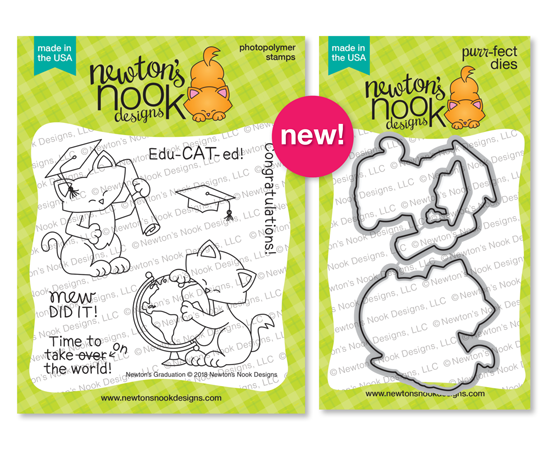 Welcome to day 1 of the April Release from Newton’s Nook Designs. We have another exciting week in store for you and we have spring on the mind! Today, Newton starts us off with Newton’s Graduation (and, of course, the coordinating dies) along with a new stand alone die set called Essential Alphabet. It is time to start thinking about the end of the school year (where has it gone?!!) and I know there will be some important graduations coming for many of you. This adorable Newton is great for those but also can multitask to cheer someone on for other big life events. 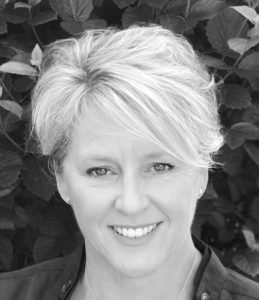 I have just the person in mind for this one…she just started a new job and I’m excited for the possibilities! I stamped Newton onto Fabriano Watercolor Paper and then colored with Daniel Smith paints. 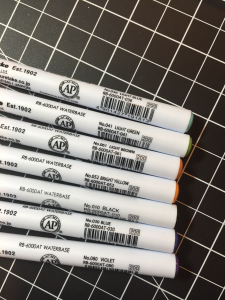 After coloring, I was inspired by the globe colors and went digging around into my papers to see what I could find. 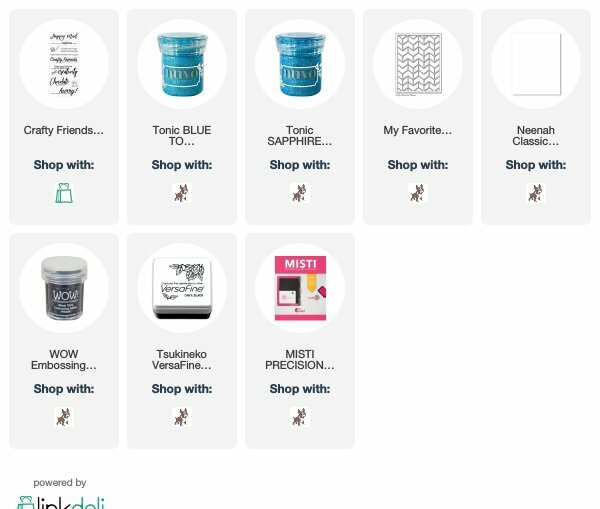 Sure enough, this retired set from Stampin’ up was perfect to use! Using the sketch from CAS(E) this Sketch #267 which seemed great for showing off our kitty friend. And oh, this sentiment…isn’t it great?! Our second reveal for the day is an alphabet die set that is a must have! The style of the letters fits almost any card type you could need to make. I will show it to you on a card tomorrow but I know some of the team will have great inspiration today. Make sure to hop through and enjoy the projects!Now on to everyone’s favorite part of release week. A chance to win!! I got a chance yesterday to create a quick card and I knew when I saw that latest from CAS(E) this Sketch I had to join in. And I knew exactly what I wanted to use for the sketch element….my Magic Stamp! I showed you a card with a Newton’s Nook sentiment during the release that used a background made with this and for today’s card, I used a background that was created using a wooden basket. The texture is really fun! 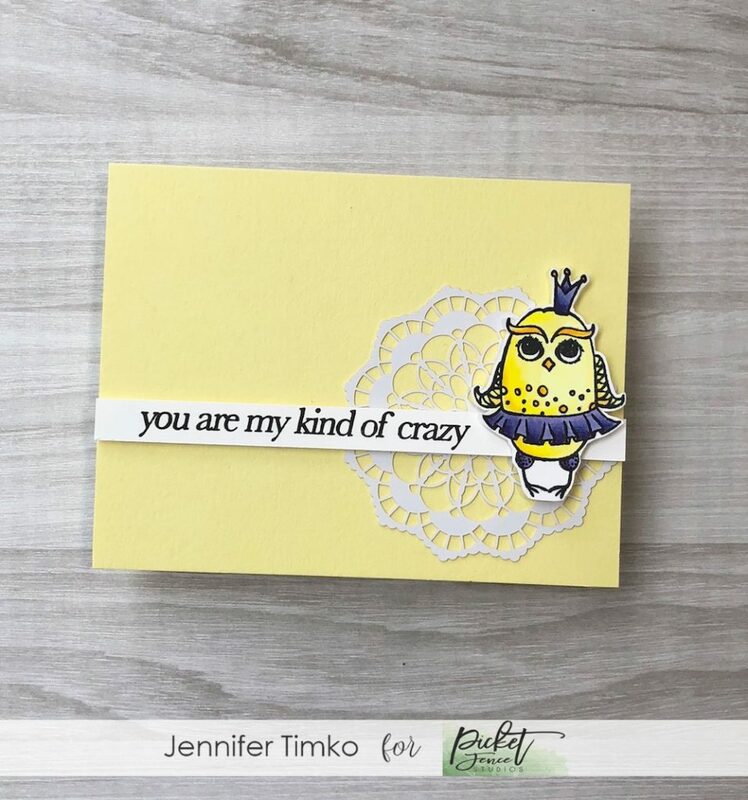 Something about the sunny yellow seemed right (since I am ready for spring) so I used my Tim Holtz Distress Oxide Ink in Squeezed Lemonade. What a pretty color! The sentiment comes from Gina K Designs (I love that die with the ‘hello’) and then I just added some sequins. 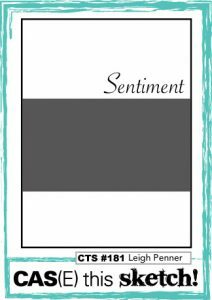 The sketch over at CTS is a great one for CAS cards and you are sure to want to join in too. Glad you stopped in today. Back tomorrow with another fun collaboration that I get to share in. Until then, have a great day! 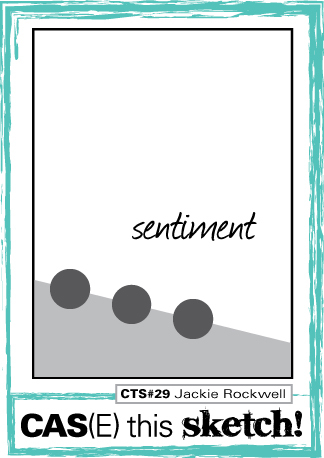 We have a beautiful inspiration piece over at The Card Concept this week and it was hard for me to narrow down which elements I wanted to use. No surprise, the team has created some really pretty projects and you are going to have fun with this one! 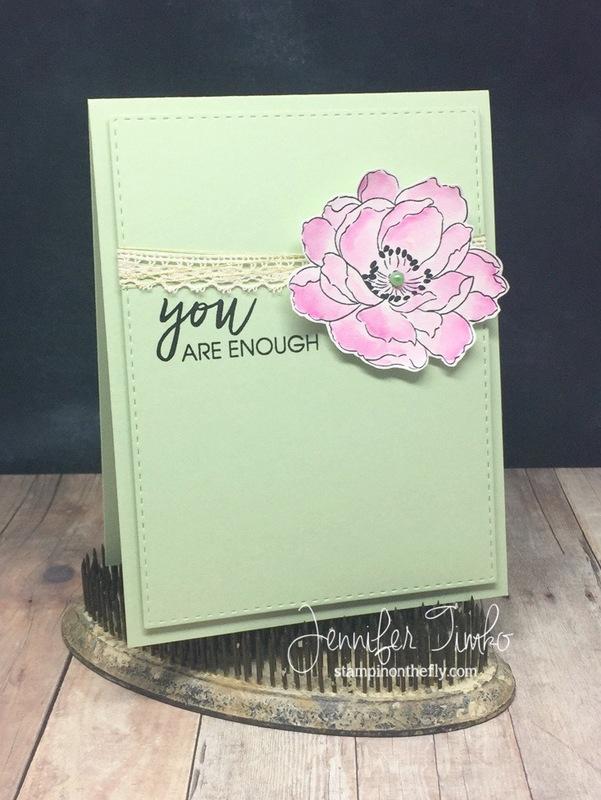 I chose to use one of my favorite flowers from the Altenew Beautiful Day stamp set. I stamped on Canson Watercolor paper using WPlus9 Black Dye Ink and then colored using Tim Holtz Distress ink in Spun Sugar and Picked Raspberry. 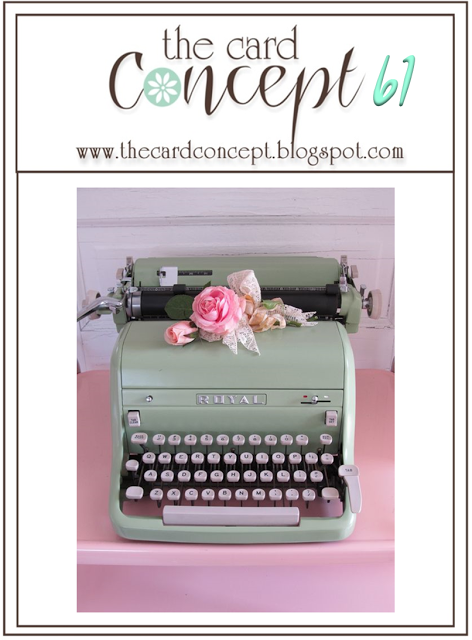 The pretty mint typewrite inspired the Mint Macaron card base. I cut image layer using Stitched Rectangled from Simon Says Stamp. 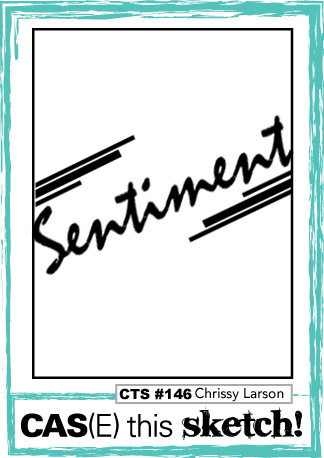 The sentiment was stamped in Versafine Onyx Black and comes from the Lovely set by Ellen Hutson (Essentials by Ellen). Finally the little details. I added some lace trim and gold thread (hard to see in the picture) to keep with the sketch from this week’s CAS(E) this Sketch. I also colored this for Kathy Racoosin’s Thirty Day Coloring Challenge….a great way to motivate yourself to color just a little every day! Just a reminder that this is my second post of the day. 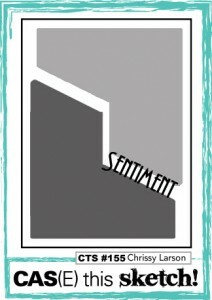 Please check my card for Freshly Made Sketches as well. I hope you enjoy this and that you are having a great week. See you soon! I have fun card to share with you today! I have been trying to play along with the 30-day Coloring Challenge again. I miss some days but I like that I think about taking time (even just a few minutes) to color….just because. It also pushes me to look for inspiration and find some fun challenges in which to play. I was able to do just that for this card. I started using the CAS(E) this Sketch challenge for the week as my sketch and also decided to join the Simon Wednesday Challenge. The sketch is a wonderfully clean one that I hope I didn’t stretch too far. 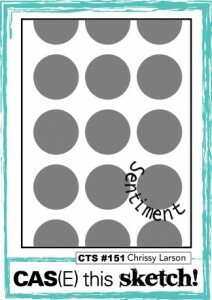 The Simon challenge is to create a scene with a focus on Newton’s Nook stamps. I used the adorable stamp set Newton’s Day Dream to create this little scene. As usual for all cat things, my cat muse is my sweet little calico Kate. I think in her perfect world she would nap with all these fun things flying about. Or so she tells me when she tried to sneak outside and is caught. *smile* I colored using my Zig Clean Color Pens in the following colors: I really do love coloring with these pens so much!! I cut the image panel out using my Wonky Stitches die to add a little more fun detail. Just a quick post today. I hope you have a lovely Saturday filled with sunshine. Happy weekend to you!! I hope you are having a great one! I had a little time to stamp yesterday and I wanted to join in some fun challenges. First, I saw an incredibly cool sketch over at CAS(E) this Sketch and I decided to combine it with the Simon Says Stamp Wednesday Challenge to use Ombre in your card. I had the feathers out on my desk still from the FMS Challenge this week so that was my starting place. Instead of using the stamp set that coordinates, I only used the Fancy Feathers Dies (Lil’ Inker Designs) and cut a couple out of Fabriano Watercolor Paper. 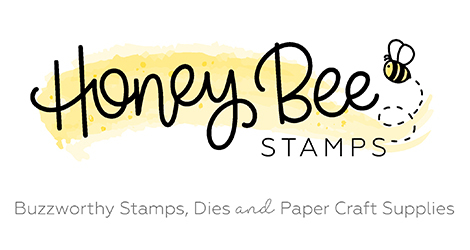 Then using Tim Holtz Distress Inks in Squeezed Lemonade, Spiced Marmalade, Ripe Persimmon and Picked Raspberry (sounds like a tasty summer treat, doesn’t it?! ), I colored to create a graduated ombre look to the feathers. After they were dry, I spritzed on a little water to add to the look. For the sentiment I went in reverse and inked up the watercolor paper first (same colors) and then cut it out with a little bonus die that I got from Taylored Expressions with an order….love the size and font on this one! Then on to the sketch. I found this one intriguing but challenging. I thought this curved stitched die from the Border Builders set (Lil’ Inker Designs) did a pretty good job of approximating the sketch so I cut some more watercolor paper with it and put in on a Tangerine Tango (SU) card base. Finally I added the White Perfect Accents (backs removed) to finish. Well, off to see what the weekend holds. Thanks for stopping in today. See you soon! I had some time to stamp last week and thought I would give the latest sketch at CAS(E) this Sketch a go. All the circles were a little daunting at first but then I found my butterfly stamp from Garden in Bloom. It works perfectly. Using my handy dandy Misti, I was able to line these up just by moving the card stock in fixed intervals. Worked pretty well! 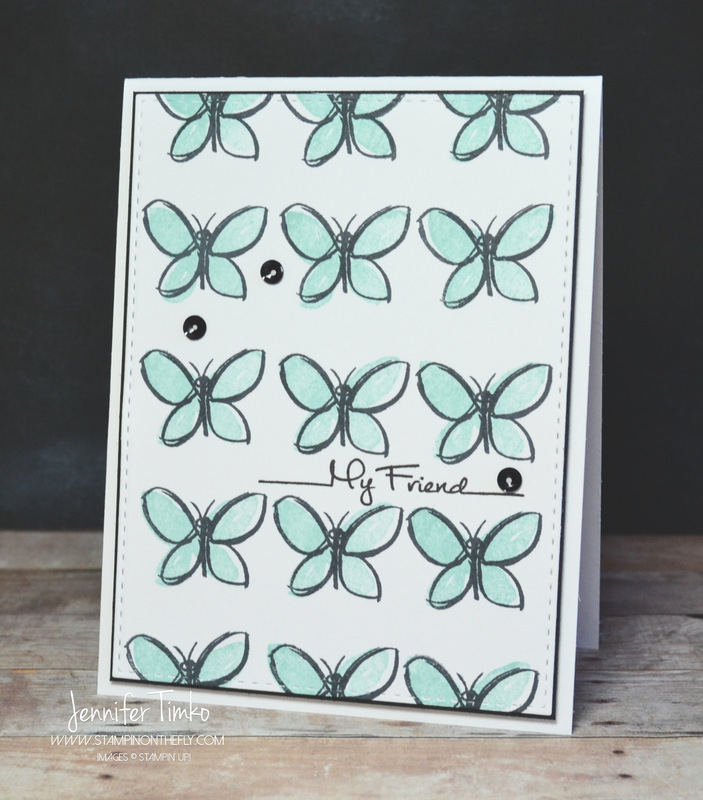 The butterflies are stamped first using Pool Party and then the outlines were stamped with Momento Tuxedo Black. I cut the panel using the Stitched Rectangles die from Simon Says Stamp and added the sentiment from the CAS-ual Fridays set Mon Ami. I added a black background panel and some black sequins from the Metallics Sequins pack. Hope you enjoy this one today. 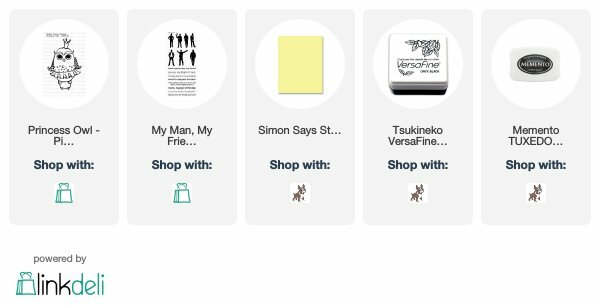 There is still some time to give the sketch a go and you’ll be happy you did. Back tomorrow with the latest from Freshly Made Sketches. Until then, have a great day! I got some extra time to stamp yesterday and thought it would be fun to join in at CAS(E) this Sketch. 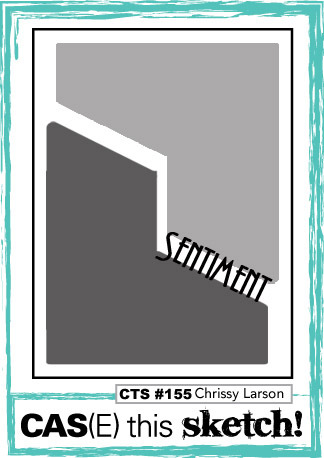 I love the angle of the sentiment in the sketch and was looking through my stamps to see what would work well. I got this awesome set called Twenty Fifteen as a bonus when I made an order from WPlus9. The sentiments are so fun and I just love the triangles. 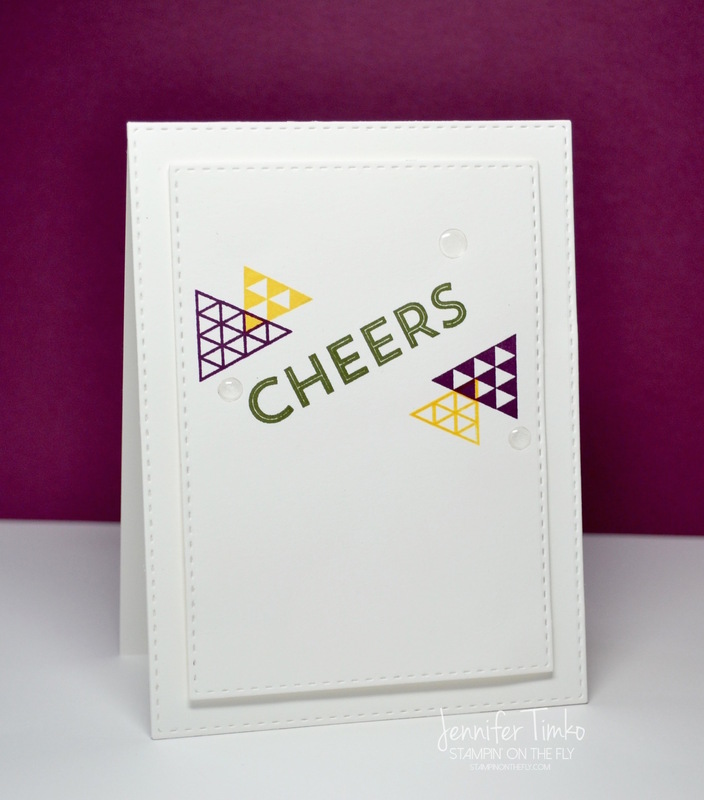 I layered and stamped the triangles using Blackberry Bliss and Daffodil Delight ink and then stamped the sentiment in Mossy Meadow. By happy accident, I found out that White Perfect Accents from SU can become clear by removing the backing….I love them as clear for this so that is what I did. The panels were cut using the Stitched Rectangles Dies from Simon Says Stamps. I’ll be back tomorrow with our month Fancy Friday hop! You won’t want to miss this one….my fancy friends are concocting some real treats for you! *smile* Thanks for stopping in today. See you tomorrow! Just a quick post for today! We had a busy weekend here at the Timko house. Went to a local strawberry festival (yum!) and hosted a laser tag birthday party for my oldest son. Wow was it fun for the kids!! The laser tag company brought everything to our house and we had 12 kids running amok in the yard for 2 hours. There was an “adult only zone” on the deck where we could cheer them on and enjoy some adult beverages and company. Perfect party all around! Naturally I need thank you cards for the generous gifts of my son’s friends. 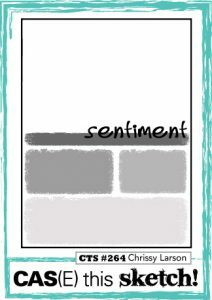 I started this morning with the idea of using some Epic Day Washi Tape and found a great sketch over at CAS(E) this Sketch. 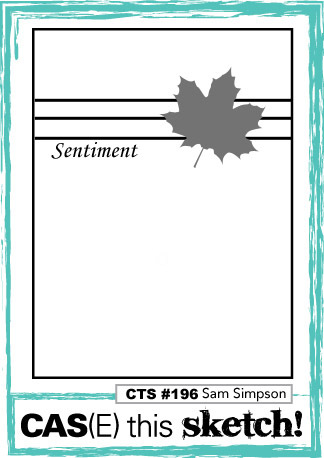 The fun sentiment and the watermark stamp are both from the Paper Pumpkin welcome kit. Ok…off to make lots more cards! I hope that your week is off to a great start. Mine promises to be really busy but in a great way. My mom comes into town tomorrow for a week; the boys start swimming (along with the soccer that is still ongoing); I have club on Thursday night; and back on reserve Friday….whew!! 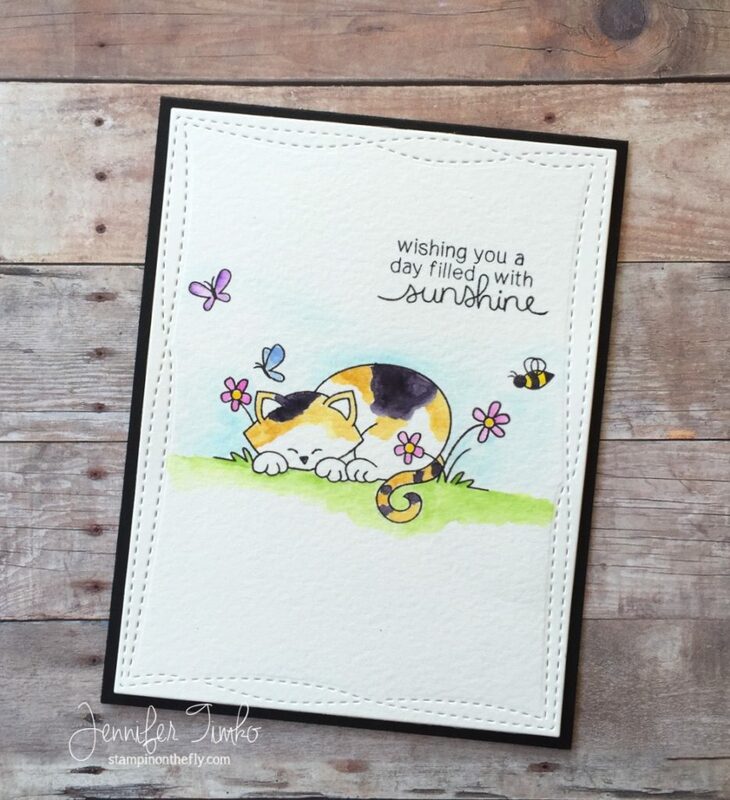 I’ll be back tomorrow with the latest Freshly Made Sketches challenge where Jen Mitchell has a great one for us! Until then, thanks for stopping in. See you tomorrow!